It's been just two years since the Hunger Games franchise came to an end, but even before The Hunger Games: Mockingjay Part 2 hit theaters, Lionsgate CEO Jon Feltenheimer teased that the studio is "actively developing" prequel and sequel ideas to continue the franchise. 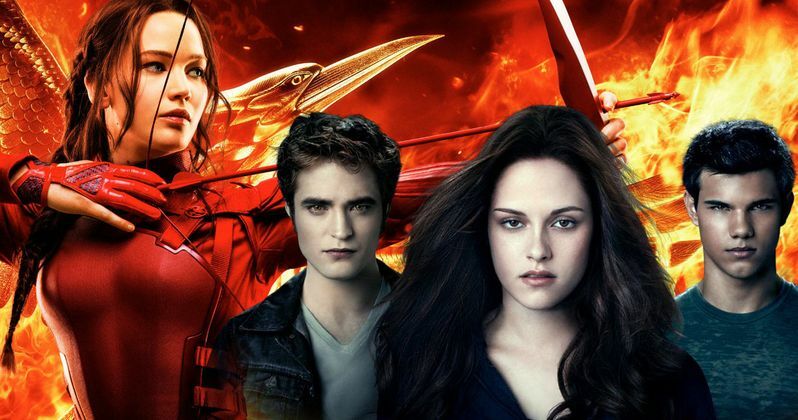 We haven't heard anything concrete on this front since then, but during an earnings conference call, Jon Feltenheimer again teased that the studio not only wants more Hunger Games movies, but more Twilight movies as well. However, he also seemed to indicate that these projects would not move forward unless the franchise creators are involved. Here's what he had to say during the investor's call below. "There are a lot more stories to be told, and we're ready to tell them when our creators are ready to tell those stories." Shortly after The Hunger Games: Mockingjay Part 2 hit theaters, rumors of Hunger Games prequels started to surface, but there was never any indication if author Suzanne Collins, who wrote the trilogy of Hunger Games novels, would be involved in any way, shape or form. It seems that the studio wants both Collins and Twilight author Stefanie Meyer to be actively involved in any project that extends either of their franchises, but whether or not that will happen remains unclear. Both franchises were quite lucrative for Lionsgate, so it's not too surprising that the studio's CEO wants to tell more stories from these franchises. Jon Feltenheimer didn't reveal any other details about these franchises coming back during this conference call, courtesy of Variety, but it's easy to see why he'd want to bring both franchises back to life. The Hunger Games hit theaters in the spring of 2012, launching not only this beloved franchise, but the soaring careers of its two young stars, Jennifer Lawrence and Josh Hutcherson. The Hunger Games opened huge with $152.5 million en route to $408 million domestic and $286.4 million international, for a worldwide total of $694.3 million, from a $78 million budget. 2013's The Hunger Games: Catching Fire opened with $158 million, with $424.6 million domestic and $440.3 million international, for a worldwide total of $865 million, from a $130 million budget. All of those numbers were franchise highs, but the decision to split the last book into two movies caused quite a bit of drop-off. 2014's The Hunger Games: Mockingjay - Part 1 debuted with $121.8 million, with $337.1 million domestic and $418.2 million international for a worldwide tally of $755.3 million, from a $125 million budget. The Hunger Games franchise finale, The Hunger Games: Mockingjay Part 2 closed out the series with franchise lows all across the board, with a $102.6 million opening, $281.7 million domestic and $371.7 million international for a worldwide tally of $653.4 million, from a $160 million budget. There has also been rumblings of more Twilight movies as well, but nothing has solidified in the four years since The Twilight Saga came to an end, after launching the careers of stars Kristen Stewart and Robert Pattinson. This franchise also saw a decrease in the final installments, after the studio split the last book into two movies, but the drop-off wasn't quite as drastic as The Hunger Games. The first Twilight movie was a modest hit in 2008, opening with $69.3 million en route to $192.7 million domestic and $200.8 million internationally for a worldwide tally of $393.6 million, from a meager $37 million budget. The 2009 follow-up The Twilight Saga: New Moon opened with $142.8 million en route to $296.6 million domestic and $413 million foreign for a global total of $709.7 million from a $50 million budget. The third installment, 2010's The Twilight Saga: Eclipse actually dropped quite a bit in its opening weekend tally, earning $64.8 million, but it ended up with a franchise high of $300.5 million domestic and $397.7 million foreign for a global tally of $698.4 million, from a $68 million budget. The Twilight Saga: Breaking Dawn Part 1 opened with $138.1 million, but ended up with $281.2 million domestic and $430.9 million foreign for a worldwide total of $712.2 million, from a $110 million budget. The final installment of The Twilight Saga, Breaking Dawn - Part 2, opened with $141 million, with $292.3 million domestic and $537.4 million international for a franchise-high global tally of $829.7 million. Whether or not these franchises come back to life remains to be seen, but anything is possible.